Just what is custody and how does it affect your responsibilities as a parent? If you're facing a divorce and have children, this probably is one of your main concerns. When children are involved, it's especially important to make the right decisions. The following article describes the basics of legal custody and what it means in everyday issues. 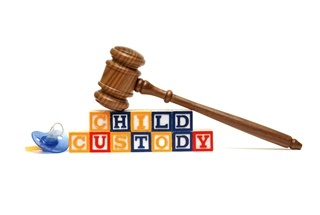 Custody refers to who has legal decision-making authority in the life of a child. The decision-making authority is usually in regard to major life issues such as religion, education, health and activities. Typically in two-parent intact families, parents share decision-making authority. The decision making process between co-cohabiting parents may reflect mutual input and a consensus model or a distribution of responsibilities where one parent takes a primary role with respect to making decisions and the other parent, generally in agreement and trusting with the decisions, takes a secondary role. Still in other families and depending on the actual issue to be decided, parents may alternate between a mutual-consensus model and a primary-secondary model. Once parents separate, there may be conflict between them on the decisions affecting their child’s life. There may also be conflict on the matter of where the child resides and how time with each parent is structured. However, custody really pertains to matters affecting decision-making authority and access refers to time spent between child and each parent. Oftentimes, these matters are confused and the parent who seeks custody may do so also with the view that the child reside with them a greater proportion of time than with the other parent. But these are separate issues. Custody X Change is software that can help you create a parenting plan or custody schedule that fits your situation. Where separated parents are in agreement on major issues affecting the life of their child and have little or no concern for the judgment of each other, they can opt for joint custody, sometimes also referred to as shared custody. Here both parents legally have an equal say as to decisions affecting their child. It is assumed that they can reach decisions either by consensus or by one acquiescing to the judgment of the other. Joint custody respects the equally important role of both parents in the child’s life and may facilitate less conflict and more involvement on the part of both parents. From the child’s point of view, this can mean more harmonious relationships which in theory leads to better adjustment. Typically joint custody works best where there are low levels of conflict between the parents or even in moderate conflict but where the parents can resolve disputes maturely. In some cases, parents opt for joint custody knowing they may periodically require the support of a mediator to reach certain decisions. If matters of violence, drug or alcohol abuse, mental illness or more than moderate levels of parental conflict exist, joint custody may be contra-indicated as it can lead to further conflict and distress to which the child would be exposed with potentially harmful consequences. More recently, the concept of parallel parenting has entered into the social science literature. This form of joint custody denotes that major decisions are likely already in place, the result of mediation or Court Order and that both parents otherwise retain decision making authority while the child is in their respective care. In other words, both parents may make decisions about things like activities, as long as they do not interfere with the child’s time with the other parent. Article by Gary Direnfeld, a court recognized expert and advocate for the well-being of children. With over 35 years of experience in social work, marital counseling, mediation, and custody and access matters, Gary strives to help parents address their issues in a manner that leads to a peaceful settlement.